Here in America’s rose capital, our seasoned Tyler pool-construction team—comprised of Blue Haven Pools and Trinity Valley Pools industry veterans—can build any size, shape, or style of gunite pool for you or remodel your existing one. From simple, standard pool designs to elaborate custom creations, count on us to build your complete backyard resort. 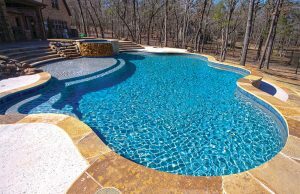 Our operation—a union of Blue Haven Pools and Trinity Valley Pools—has built thousands of gunite pools throughout Tyler, Bullard, Palestine, and the surrounding area. In fact, members of our crews boast an average 20 years of experience, and our construction manager brings 26 years of expertise—as well as a degree in engineering. We are a member of the Tyler Area Builders Association, the Tyler Chamber of Commerce, and we maintain an A+ rating with the East Texas BBB. 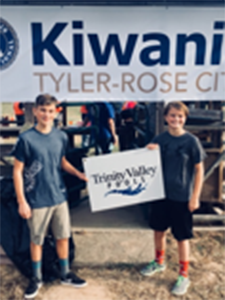 Local homeowners have also made our Trinity Valley Pools team a winner of the Tyler Locals Love Us for the category “Swimming Pools Sales/Service”. And check out our Facebook reviews with high approval ratings! We provide solutions to homeowners whose goal is to enjoy their pool—vs. working to maintain it. What do you picture for your new custom pool & spa or renovation? 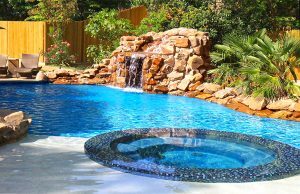 With Blue Haven, you can have any kind of pool design with your pick of decorative and functional features and accents. Some local favorites include beach entries, tanning ledges, waterfalls, grottos, bubbler fountains, sheer descents, interior tables, rain curtains, negative edges, and faux negative edges. We also offer the full spectrum of interior finishes: Traditional white plaster, color quartz aggregate, mini-pebble, micro-fusion pebble, and radiant-fusion pebble. In addition to new pool construction, we can upgrade your entire outdoor space. Choose additions such as retaining walls, built-in island barbecues, complete outdoor kitchens, fire pits, fire places, custom pizza ovens, pergolas, aluminum lattice covers, walkways, and splash pads. Landscaping is also available. We even own and operate a private rock yard. What that means for you is a wide selection of premium and select stone and rock. Better yet, it means you’ll save because we share our wholesale prices with you! After your aquatic retreat resort is built or renovated, you can depend on our experienced team for weekly pool service, technical assistance, and selection of pool supplies. Our massive 7,000-square-foot showroom and retail pool store ranks as the largest in East Texas. Our friendly staff is available to help you seven days a week for all of your pool-related needs, including pool and spa chemicals, parts, and accessories. We offer free pool-water testing as well. 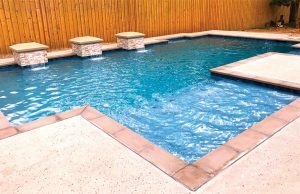 Other services include vinyl liner replacements, pool openings and closings, weekly pool cleanings and water maintenance, chlorine-to-saltwater and chlorine-to-ozone conversions, and VGB main-drain retrofits. 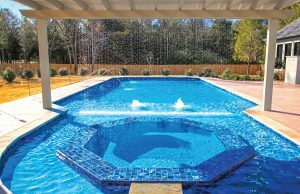 Blue Haven—with our team of long-time service professionals from Trinity Valley Pools—also serves as an authorized warranty station for the full range Pentair and Hayward pool equipment. Let us help you get started on your new pool, pool renovation, and backyard makeover. Using professional CAD software and 3-D virtual reality simulations, we can bring your pool plan to life before your eyes. Call us to schedule an appointment for your new aquatic retreat! Association (TABA) Parade of Homes every year since 1997, as well as TABA’s Home show since 2006.